I started knitting mittnz for the Cheyenne River Reservation annual blitz. 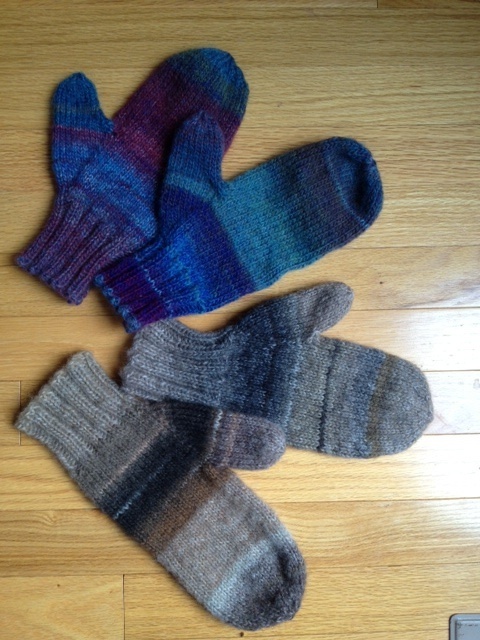 I had recently seen my old trusty handwritten mitten pattern, but then lost it again (senility much?) So I looked at some patterns on Ravelry. None of them were for the gauge of my yarn and size of my hands. 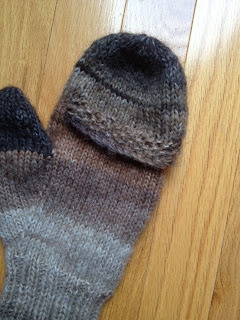 I wanted mittens with a long cuff and a gusset, not afterthought thumbs. So I figured out my own pattern, making them the size to fit my (rather large) hands. The yarn is Lion Brand Amazing, in 2 different colorways. Now, can you believe that each pair was knit from a single skein of yarn, except for about a half-inch of the top and one thumb? I love the yarn and all the colors! It is soft, too. But these really don't look like mates. And I knit in the round until at the base of the fingers, then knit seed stitch back and forth for a bit across just less than half the stitches, cast off that flap. Then I started a new flap the same size, knit for about the same, and then continued knitting in the round until done.